With just over a month left until DePaul opens its season against Bethune Cookman on Nov. 7, the players are set to return to the court for organized practice this coming week. The full Big East schedule was released as a reminder the season is fast approaching. At first glance, the non-conference schedule looks quite different from last year’s when Notre Dame, Illinois, Michigan State and Oregon marked four of the first five games on DePaul’s schedule. This season, with a veteran but new group, that features three seniors, two fifth-year players and a couple other players coming off redshirt seasons, DePaul head coach Dave Leitao opted to space out the non-conference opponents in hopes of allowing his team to find a rhythm early in the season. After opening Wintrust Arena against Notre Dame last season, the Blue Demons will travel to South Bend, Indiana to take on Mike Brey’s squad on Nov. 24. The Fighting Irish pulled away in the second half last season for a 72-58 win. Notre Dame is coming off a disappointing 21-15 season in which they failed to receive an NCAA Tournament bid, but Leitao said having the opportunity to play a consistent power like Notre Dame is an opportunity they can learn from. 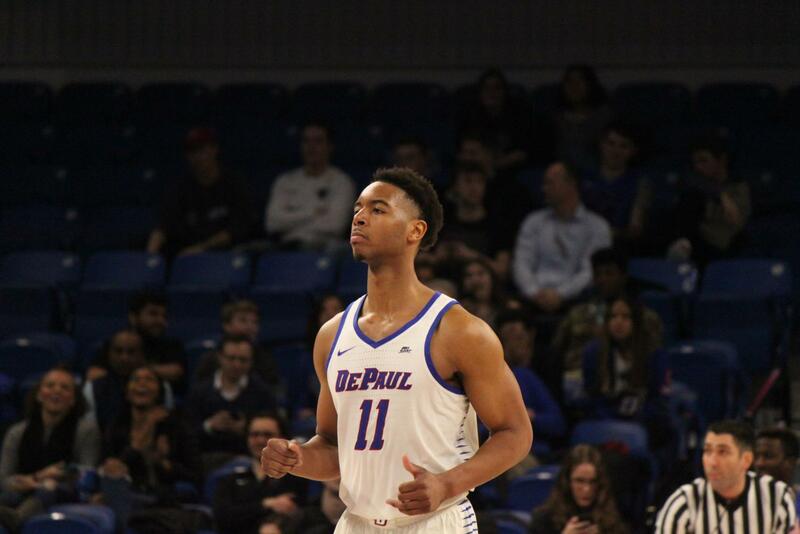 DePaul’s home portion of the schedule is bookended with two teams on the rise. Penn State, who won the NIT last season, and Boston College, who made one of the biggest jumps in college basketball when they won 19 games after winning just nine the year before. Senior guard Eli Cain said both these games, along with Notre Dame, are an opportunity to build confidence and put their name on the map early on. The Blue Demons’ conference season begins in familiar fashion with matchups against the top two teams from last season, Xavier and Villanova. Junior guard Jalen Coleman-Lands is looking forward to opening with these two opponents. With over the half roster new from last season either through transfers or as freshman, Cain said while he will have to talk to the younger players about what to expect in those 18 games, playing in those games will provide the best experience for the new players to learn what playing in the Big East is all about. For Cain, his trips back to the east coast are going to come early on with Villanova and St. John’s marking two of their first four games in Big East play. The senior guard said players usually do pay attention at the schedule, eying key dates such as when they may make a trip home if they are from out-of-town, as is the case with Cain. One of the tougher stretches of the season comes in mid-January with three straight road games to Seton Hall, Marquette and Providence. Coleman- Lands said handling that tough stretch starts with their mindset in practice. Adding another wrinkle to the schedule, the Blue Demons will play four of their last five games against Georgetown and Creighton. Last season, the Blue Demons went 1-3 against those opponents.